Ethos Vapors has been in business since 2014 (the vape equivalent of eons), so it’s a safe bet the mixologists know their way around an e-liquid lab. Their latest Core line of products puts the focus on fruits and gives each offering the name of a powerful figure from Greek mythology. Athena, goddess of wisdom and war, is also the moniker of Ethos’ new watermelon-pomegranate blend. Delivering an immediate and satisfying burst of flavor, it’s one of the most relaxing fruit blends in this new generation of e-liquids. The combination of watermelon and pomegranate is like running into the ocean on a hot summer day – intense, cool refreshment. The flavors combine to produce a mixture of sweet and tart, making it one of our new late-summer favorites. What’s exciting about this mix is its ability to transport me into a cool, relaxed headspace. That visceral quality puts this in the category of a light and breezy summer blend. When I close my eyes as I take a puff, I think of being on the beach or laying poolside without a care in the world. It’s exactly what I look for when I’m in the mood to just sit back and enjoy myself. A complicated flavor profile makes this more than just another fruit juice. What the guys at Ethos manage to pull off is a complete subversion of expectations when it comes to the relatively simple ingredient description. Take, for instance, watermelon-flavored liquids. Sometimes, watermelon comes across too strong, as mixers use a heavy hand to make sure the delicate flavor is discernible. With Athena, the watermelon flavor delicately bounces off the tart pomegranate fruit, smoothing the blend. Once you jump in, the watermelon crashes over you before receding into a tart kick that keeps you coming back for more, all while a smooth cream rounds out the profile. Normally when I think of pomegranate my mind conjures a strong, almost sour taste that puckers my lips. However, with this blend, the pomegranate is added sparingly as a perfect foil to the sweeter tone of watermelon. One thing is clear: the mixologists who came up with this liquid put a lot of thought into their work. 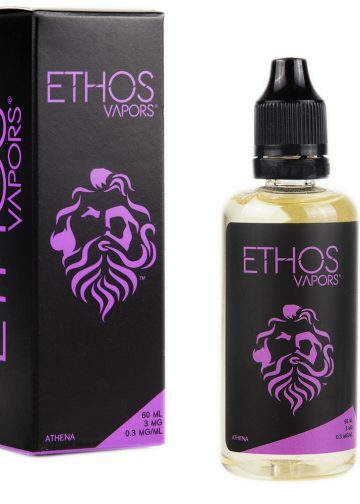 Ethos once again is at the forefront of flavor development, the brand proves that by offering some of the highest-quality and most creative combinations on the market. The most impressive part of is that they’re able to balance flavors that you wouldn’t normally think would go well together. Athena is a unique combination of watermelon and pomegranate swirled to create the ultimate summer blend. With a little kick and a little bit of cream, this puts a new twist on the classic watermelon mix. Highly recommended for vapers who really love to dig in deep, exploring new and interesting fruit combinations.